It is always very positive to see new ventures in the premium food and drink market with provenance and quality being key factors in the decision making process. One such venture is Marlish Spring Water based in Hartburn, Northumberland. Located on a 250 acre farm the water is drawn from deep in the heart of the Northumbrian hills. It took hundreds of years for the rain water to reach the aquifer which is deep underground beneath prehistoric carboniferous rock. The unique rock and mineral strata in this part of Northumberland gives Marlish it’s unique and refreshing taste. The source sits alongside The Devil’s Causeway, an ancient and once well-used route running 55 miles from Corbridge to Berwick. The water is believed to have been drunk by both the Romans and the Knights Templar, who visited the 11th Century St Andrew’s Church in the picturesque village of Hartburn. The purpose built bottling hall is set amongst more than 5,000 trees that have been specially planted as part of a carbon offset programme. This also has created areas where natural wildlife can flourish. The bottling line runs both glass and PET bottles which can make adhesion difficult when running self-adhesive labels. Additional technical challenges are that the 9/10th’s wraparound labels on the glass bottles are transparent to give distinctive branding. However glass bottles are better labelled before filling to avoid the problems of condensation on the bottles. This is a condition which makes label pick up temperamental and also the possibility of water under the label which gives opaque spots. The PET bottles being used are not strong enough to be labelled empty. Therefore in the initial stages of production a self adhesive labeller machine was located post filling but this gave indifferent results. To enhance the quality of this premium product a decision was made to purchase a new self adhesive labeller from Enterprise Tondelli who have supplied bottle labelling equipment for many years.The machine was manufactured in Italy by BRB Globus who are the labelling partners of Enterprise Tondelli. A rotary machine, model Mega ADE, was selected to ensure accurate labelling of the bottle. This design ensures that there is no bottle wobble that may be observed on an in-line machine which then manifests itself by imperfect off set labelling. With a premium product such as Marlish it was essential to provide the best labelling solution possible. 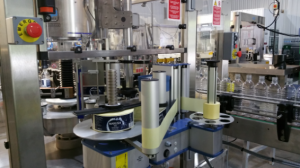 Another example of a labelling with long self-adhesive labels, supplied by Enterprise Tondelli, can be found at Brewdog Plc which has dual stations for auto reel change over. The problem with handling PET bottles pre-filler was designed out by using an empty bottle pressurisation system. 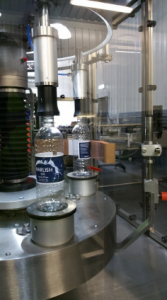 This self adhesive labeller is fitted with the system on each individual bottle platform so that each bottle is pressurised whilst it is being labelled to ensure no bottle crushing. Enterprise supply the full range of labellers from reel fed to wet glue to self adhesive to modular labellers. They can be supplied as single machine projects or as part of a complete bottling line. The Enterprise Tondelli website has a host of other interesting case studies about complete bottling / canning lines, new brew houses, high speed packaging solutions, palletising etc – ” suppling from single machines to turn key projects”. Further details of Marlish Water and their products can be found www.marlish.co.uk along with details of where their water can be purchased.